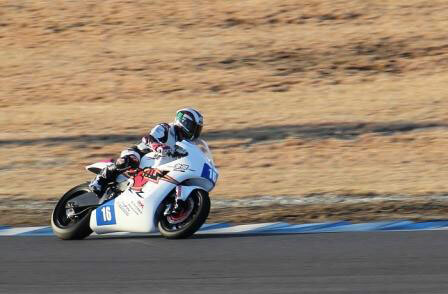 MUGEN Shinden & John McGuinness complete first test. Following a successful test at Twin Ring Motegi where 17 time Isle of Man TT winner, John McGuinness, was introduced to the MUGEN Shinden EV bike on which he will make his debut in the 2012 TT Zero class, McGuinness stated “I am honoured to be asked to ride the MUGEN Shinden, which, originating from a company with such pedigree and from a country where over the years the best racing motorbikes have been produced, could prove to be a major milestone in the history of the TT Zero event.” McGuinness then went on to say; “the bike was as you would expect from a company such as MUGEN; a well-designed and well put together proper race bike. As soon as I got underway it felt natural and I almost forgot it was fully electric while I was also learning the Twin Ring Motegi circuit for the first time. Now, having ridden the MUGEN Shinden I am looking forward even more to competing in my first TT Zero event.” “this was a trip of firsts; my first time riding an electric bike, my first time around Motegi, and also the fulfillment of a lifelong ambition to visit the Honda Collection Hall, which is situated within the circuit complex. All in all, a really satisfying trip” Team MUGEN principal, Satoshi Katsumata said “we are very happy with the performance of the MUGEN Shinden at this first major test for the bike. The package performed as expected and, despite some unseasonal weather on day One, we were able to run through our planned programme and collect some very valuable data. Of course having a rider with such experience as John McGuinness, and the unique TT-specific feedback he is able to give us is a tremendous boost to the team and the whole Team MUGEN TT programme.” The MUGEN Shinden will now benefit from further development based on data from Motegi, prior to shipping to the UK where it will undergo further testing before its scheduled UK public debut at Isle of Man on 2nd June.